A few hours before embarking on the murder in Neve Tzuf, Omar al-'Abd, 19, from Kubar wrote a will on his Facebook page: "My will to you, I am a boy who has not yet reached the age of 20. I have many dreams and aspirations, I know that with my Allah my dreams will come true. They are the ones who kill our women and our young men, and they defile our Al-Aqsa and we sleep." The murderer also wrote: "Take your weapons and resist! They have declared war on Allah, they closed Al-Aqsa, and what of your weapon? I have only a knife and it will respond to Al-Aqsa's cry ... You are fomenting a civil war between us and Allah will judge you for this. We are all sons of Palestine and al-Aqsa; the sons of monkeys and pigs do not open the gates of al-Aqsa. I hope that after me, men will come out and strike with an iron hand. I know that I'm going and I'm not returning to here. I am going to heaven next to Allah. I ask you, leave me alone. My mother, my father, and my sisters, I'm going to heaven, that's my home. I want nothing more than that. Allah will judge those who do not fulfill my will. Put on my head an al-Qassam ribbon and on my chest one to Abu Amar (Arafat). I will enter with them to the grave. Play songs at my funeral; I ask you to unite your ranks: We are all one, we have one blood, one enemy, and one al-Aqsa." 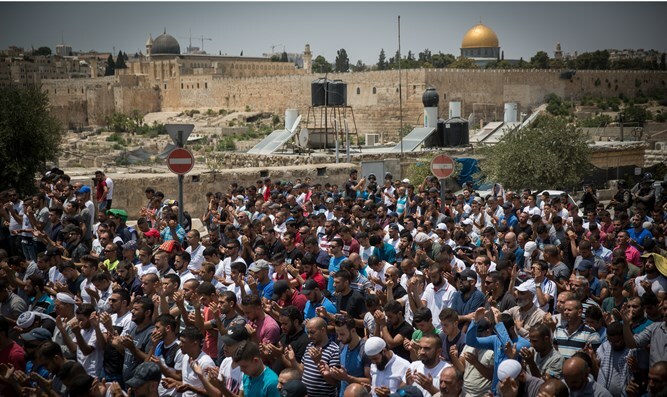 Hamas welcomed the attack, calling it a natural response to what was happening at the Al-Aqsa Mosque. The statement said that they "welcome the heroic attack that comes in the wake of Israel's violation of the rights of our people in Jerusalem and the Al-Aqsa Mosque."